Page 3 : Backlightweb (Deltablue ltd) CCFL, backlights, bulbs, and special order special shaped bulbs!, shipped worldwide, Nothing custom is to much work for us. 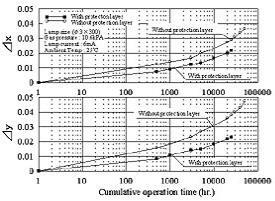 Operating the lamp gradually deteriorates glass and phosphor due to the influence of ultraviolet ray, and the longer cumulative time of operating tends to drop the luminance maintenance ratio and chromaticity shift. The starting voltage (Es) is the characteristics proportional to the lamp length and inversely proportional to the lamp inner diameter. 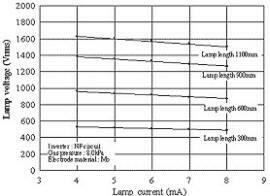 The lamp voltage is the characteristics inversely proportional to the lamp current due to each lamp having the negative resistance characteristics. 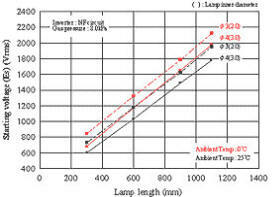 Also the smaller lamp inner diameter increases the lamp impedance, requiring the proportionally higher lamp voltage. 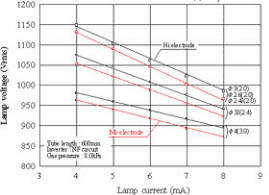 Different outer lamp diameters with the same inner tube diameter do not affect the lamp voltage characteristics. The lamp voltage depends on the electrode material; therefore the low power consumption type Mo electrode is recommended. *Click upper side image for large image. 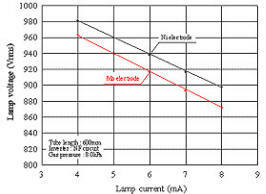 The luminance and the total luminance flux increase almost linear to the increase of the lamp current. 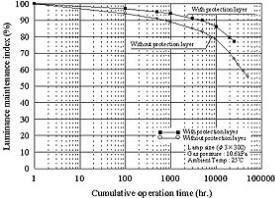 Light output varies in different ambient temperature because the lamp lights by ultra violet ray radiated by the excitation of mercury vapor (i.e. ionization). 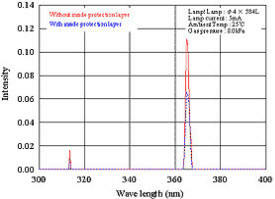 As for the relations between the luminance and the lamp surface temperature, the luminance has the peak value with its temperature at the coldest spot at around 65℃. 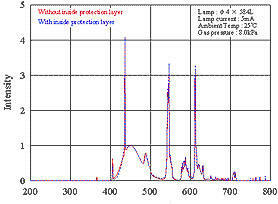 This peak value(65℃) is not determined by the lamp diameter.